Here’s a simple but very efficient idea to solo over II – V progressions. It consist of shifting a minor 3rd upward to create the altered dominant sound. In other words, when soloing over a II chord in any positions, you can shift to the equivalent position a minor 3rd upward to get the V(alt) sound. This shift will lead you to a IV minor over V. This will produce a very hype V7sus(b9) sound. This substitution is very common in bebop soloing, Joe Pass, Herb Ellis, Barney Kessel… just to name few, are using this idea on a regular basis.This idea will also work for chord melody or comping but it will work best into ‘cadencial’ areas since it will result in a very dense altered sound. So, one of the coolest thing about this concept is that it work with any version of the II chord. Let say, you move a standard IIm7 a minor 3rd higher, it will result in a V7sus with a b9, #9 and b13. If you are playing on a melodic minor scale and than move a minor 3rd higher, it will result in a V7sus with a b9 and #9. It will also work on any minor II – V. So, if you are soloing on a IIØ than shift a minor 3rd higher, it will result in a V7 with a b9, #9, b5 and b13. Note that you absolutely don’t need to know or understand the previous section to use this concept. Just move to a position a minor third higher and it will do the trick. On a personal note; practicing this concept really helped me ear the alterations, not only as colors but as working melodies. Having a familiar frame to solo over really help unlock the melodic ideas. Let go with some examples! The first series of examples will be motifs transposed note for note a minor 3rd higher. This is a very common way to use this concept. Examples 1 to 4 are using standard m7 runs. Examples 5 to 8 are using some more colorful II motifs using m(maj) runs and m7(b5) runs. So, previous examples were motifs transposed note for note but you can use this concept in a more free way by using the shifted position to develop your run. Next examples will consist of runs starting from II, going to V7(alt) using the shifted position to create the altered sound. In this particular example I am finishing the line with a very idiomatic bebop motif. This concept is not rigid, you can mix it up with other altered ideas. Note that I am using a ♮2 on m7(b5) chords. This is very common, most jazz musicians will avoid the b2 on these chords especially when they have a II role. You don’t need to go too symmetrical too. A good idea is to extend your II run and use the shift only as a tension before resolving to I. Next 2 examples demonstrate this idea. O.K. so ultimately the goal is to ear this substitution and not really think of it. A good idea to develop this is to play the ‘shifted’ run on the same position. So basically you will not shift. Just think of the minor position starting a minor third higher and play it on the same position. Pay particular attention to the voice leading between the 2 chords in the next 2 examples. As I said in the introduction, this concept can also work for comping and chord melody. Just note that it will result in some very dense altered sound so using it in the middle of a form isn’t a very good idea. This will work best to end a form or any place you need a strong cadencial sound. Here’s some examples of this concept applied to comping. This one is using some type of Barney Kessel double stop. It work just fine! That’s it! I hope you liked that lesson. 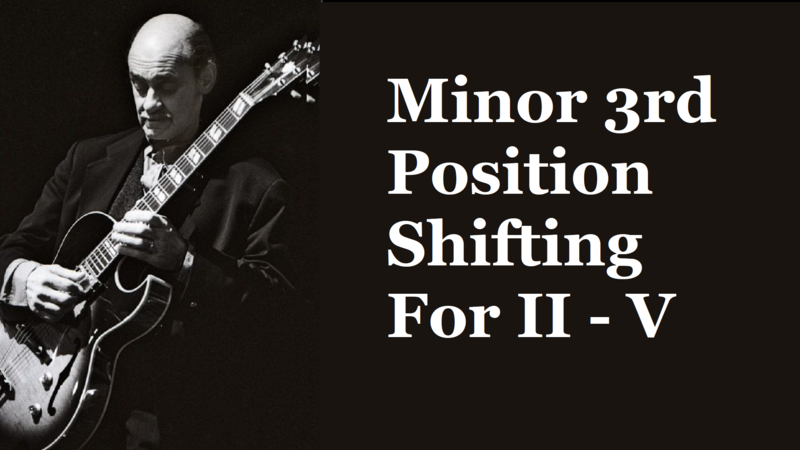 This minor 3rd shift can be applied in many ways, you can also do many minor 3rd and end up with the whole Pat Martino substitutions concept but I felt It was better to start with this particular one and expand on this idea. I’ll do something for the other minor 3rd substitutions in the future. Cheers! Support me on Patreon to access this lesson’s PDF file and help me keep the content coming!